The contemporary genetic structure of species offers key imprints of how organisms responded to past geological and climatic events, which have played a crucial role in shaping the current geographical distribution of north-temperate organisms. 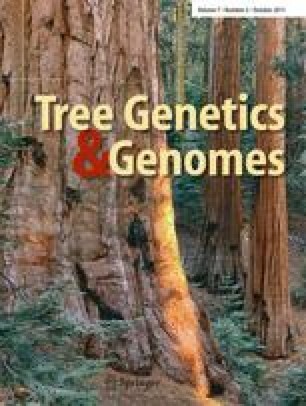 In this study, range-wide patterns of genetic variation were examined in Douglas-fir (Pseudotsuga menziesii), a dominant forest tree species distributed from Mexico to British Columbia in western North America. Two organelle DNA markers with contrasting modes of inheritance were genotyped for 613 individuals from 44 populations. Two mitotypes and 42 chlorotypes were recovered in this survey. Both genomes showed significant population subdivision, indicative of limited gene flow through seeds and pollen. Three distinct cpDNA lineages corresponding to the Pacific Coast, the Rocky Mountains, and Mexico were observed. The split time of the two lineages from the Rockies lineage was dated back to 8.5 million years (Ma). The most recent common ancestors of Mexican and coastal populations were estimated at 3.2 and 4.8 Ma, respectively. The northern populations of once glaciated regions were characterized by a high level of genetic diversity, indicating a large zone of contact between ancestral lineages. A possible northern refugium was also inferred. The Mexican lineage, which appeared established by southward migration from the Rockies lineage, was characterized by the lowest genetic diversity but highest population differentiation. These results suggest that the effects of Quaternary climatic oscillations on the population dynamics and genetic diversity of Douglas-fir varied substantially across the latitudinal section. The results emphasize the pressing need for the conservation of Mexican Douglas-fir. The online version of this article (doi: 10.1007/s11295-011-0392-4) contains supplementary material, which is available to authorized users. We thank S. Senneville and S. Blais (Canada Research Chair in Forest and Environmental Genomics, Univ. Laval), as well as M. Deslauriers and P. Laplante (Natural Resources Canada, Canadian Forest Service) for laboratory assistance. We are grateful to S. Gérardi, J. Godbout, and M. Lemieux (Canada Research Chair in Forest and Environmental Genomics) for their help with data analysis and for valuable discussions. We also thank the two anonymous reviewers and the associate editor S. Aitken for their insightful comments and suggestions on this manuscript. Our thanks are also due to G.E. Rehfeldt (USDA Forest Service in Moscow, Idaho) and F.T. Ledig (UC Davis, California) for providing seeds of the three Douglas-fir populations of the Rockies-transition region, and of P. macrocarpa, respectively. The collections of samples for Mexican populations and for P. sinensis were supported by CONACYT (Grant 33617-B and 2002-C01-6416) and the National Natural Science Foundation of China (Grant No. 30500030), respectively. This study was supported by grants from the Mexico-Québec Program of the Ministère du Développement économique, de l’innovation et de l’exportation du Québec, the National Sciences and Engineering Research Council of Canada, and Natural Resources Canada. This study was part of a task of the Forest Genetic Resources Working Group of the North American Forest Commission/Food and Agricultural Organization of the United Nations.